Successfully Added 5MP Digital Camera with 2 Inch LCD Swivel Screen + SD Card Slot to your Shopping Cart. This multi-function digital camera comes with a swivel 2 inch LCD screen, and an SD card slot for you to store all your captured videos and photos. With an added extra cool feature, the Lens angle can be adjusted to assist you in capturing photos and taking videos from difficult angles. This digital camera also comes with a simple internal menu system that allows the user to set their preferred settings with ease. The zoom controls, flash switch, menu button and mode button are conveniently located on the body of this cool digital camera, so you can access the controls easily, allowing you to focus more on taking pictures without having to always look around for the zoom or flash switch. The CVA-DV71 also support AV out, so after an adventurous day of capturing photos and videos, you can use the Jack to RCA cable to connect this digital camera to your TV for playback viewing. 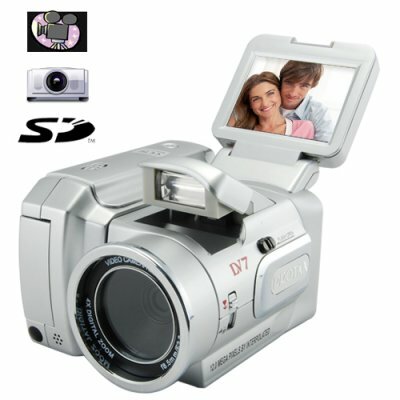 In addition, this digital camera and camcorder can be used as a PC camera. This neat device comes with standard function like audio recording, and can be use as a mass storage device. So whether you are a sports enthusiast or just enjoy taking random photos when out and about, this all in one digital camera won't let you down. Get one today and experience the magic for your self. The CVA-DV71 is available at a factory direct wholesale price from the leader in wholesale electronics, Chinavasion. Note on Interpolation: Please note that this camera can take images in sizes equivalent to 12.0 mega pixels (MP). This is through a software resizing process on the camera called interpolation. The image sensor of this camera has a native resolution of 5.0MP mega pixels. Comes with manual pop up flash, and swivel lens body help you be creative. Can this digital camera also be used with a standard tripod? Yes, the CVA-DV71 can be used with a standard tripod. 2 Star for good service but -3 on product. I recieved my DV7 recently and i was a bit disapointed with quality picture/video, the LCD looks too dark and the flash only works for taking pictures. Image quality is less than what i expected. Sorry but on a positive note i recieved product in good time. I only gave this product 3 stars because it has a low quality picture/video, the LCD looks too dark when taking pictures and the flash only works for taking pictures. Image quality is less than what i expected but is a great product to sell for wholesale. Chinavasion should this give this product on a value of around $90 because is too expensive for its picture/video quality.